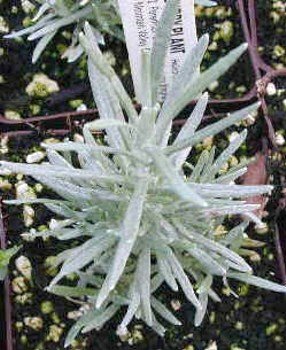 Proper name: Helichrysum italicum Hardy in zones 8-10 or houseplant. It grows 10" tall In cooler regions grow as an annual or patio plant, moving indoors during the winter It blooms late summer to early fall. It grows 10" tall Immediate shipping in 3" pot. HERBS: Treat yourself to fresh herbs right from your garden! The difference when home grown is impressive! All are excellent for adding distinctive flavor to meat, and fish dishes, gravies, soups, salads and vegetables. They are fun to grow and make an attractive garden addition! Curry Plant looks very similar to a Lavender in its leaf stage. But, it looks totally different in bloom. Curry Plant likes it warm and dry. It is native to Turkey and thrives on sunny slopes. With Curry Plant the million dollar question is, "What does it taste like " Curry Plant smells strongly like Curry spices. When Curry Plant is mentioned with food, it is always used sparingly, a few leaves in a mayonnaise or a sprig tucked in a cavity of a chicken. Trimming Curry Plant in the garden will leave you pleasantly smelling like an Indian Restaurant. The Curry Plant prefers full sun. It blooms late summer to early fall. It grows 10" tall. Space 10" apart. Hardy in zones 8-10. In cooler regions grow as an annual or patio plant, moving indoors during the winter.